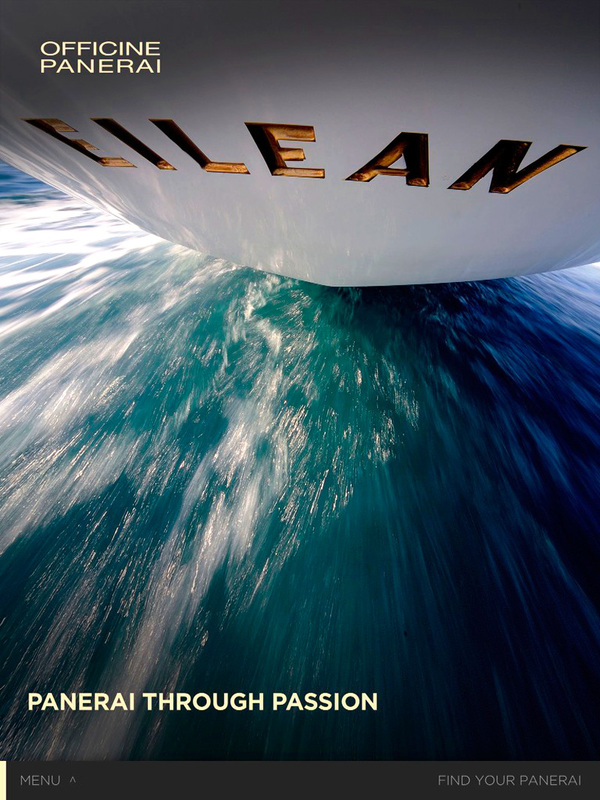 Panerai Recently announced the PANERAI Classic Yachts Challenge schedule for 2013, as seen below. You can learn much more by visiting the Regates Royales website, which contains much more information about these amazing racing events. MARCH 2013 - The Panerai Classic Yachts Challenge, the leading international circuit for vintage and classic sailing vessels, is preparing for the 2013 racing season and is pleased to announce the addition of a new host city and regatta to its ranks. Naples, one of the world’s most nautically-historical cities, joins the PCYC’s Mediterranean circuit this year, with its exquisitely beautiful bay in the Tyrrhenian Sea providing the backdrop for the 10th edition of “Le Vele d’Epoca a Napoli” between June 26thand 30th 2013. This debut on the Panerai Classic Yachts Challenge international circuit is an acknowledgement of the Neapolitan regatta’s burgeoning status on the classic sailing scene. 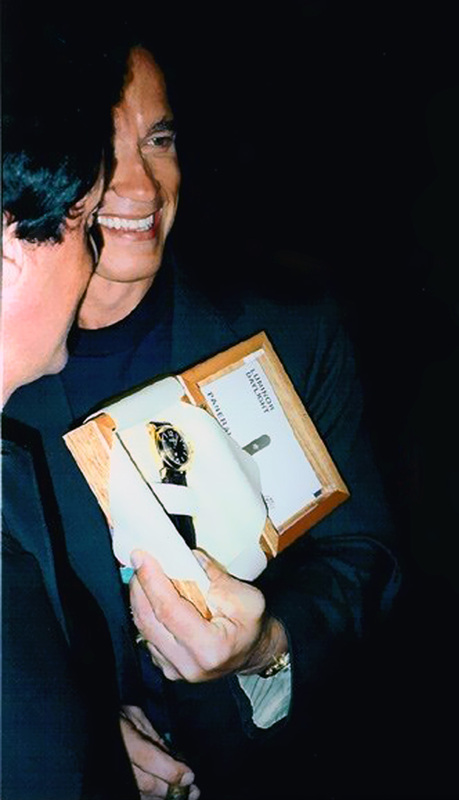 It also celebrates the partnership between its organizers of the last decade, the exclusive Reale Yacht Club Canottieri Savoia (www.ryccsavoia.it), and the Italian Navy’s Staff Sailing Office, who welcome their newest sponsoring partner: Officine Panerai, the Italian-designed, Swiss-made high-end watch brand. Over the last decade, Officine Panerai has become an integral presence on the worldwide classic racing circuit; a passionate endeavour the company took on as a nod to the watchmaking brand’s historic links to the world of the sea. The 2013 Panerai Classic Yachts Challenge opens, as per tradition, with the much-anticipated Antigua regatta which is held in the Caribbean every April. The exciting regattas which comprise both international circuits (Mediterranean and North America) also return this summer under full sail, as will the Cowes regatta which is held in early July on the Isle of Wight, U.K.
Last year, the Panerai Classic Yachts Challenge regattas attracted more than 600 entries in the course of the 10 international events on the calendar, with many of the world’s most celebrated classic sailing yachts participating. The 2012 overall prize-winners of the Mediterranean Circuit, which were handed out in Cannes, France at the end of the sailing season, wereMoonbeam IV in the Big Boat category, Leonore in the Vintage class, and Naïf in the Classic category. Across the Atlantic Ocean, in Newport, RI, the 12-metre Valiant took the overall trophy for Best Overall Performance in the North American classic series. This is an article I have thought about writing for years. My plan is to likely write it in 3 parts, with this being Part 1. 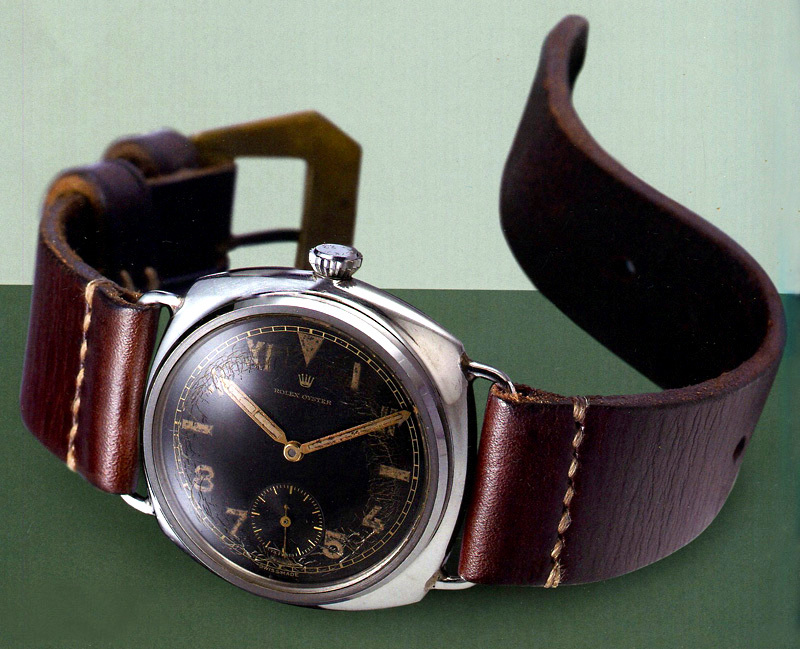 Much of Panerai's Vintage history is a big mystery. As Winston Churchill once said "It's a riddle, wrapped in a mystery, inside an enigma, but perhaps there is a key." My goal is to find the key and unlock mystery. 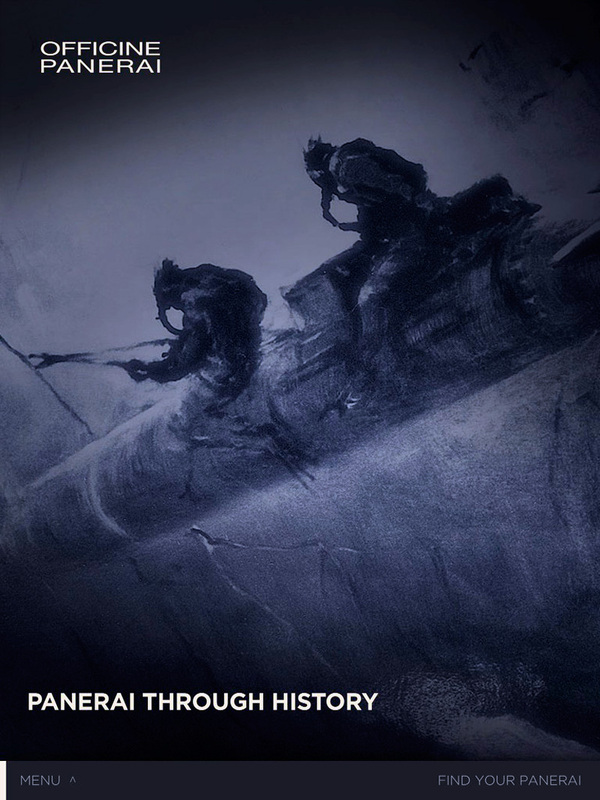 The objective of this story is to once and for all separate the fact from the fiction on some key Rolex/Panerai history, as well as to shed more valuable light on the ethos of the history and evolution of dive watches. There has been an ongoing debate for years about wether or not Rolex or Blancplain was the first to come out with a diving watch in the early 1950s. 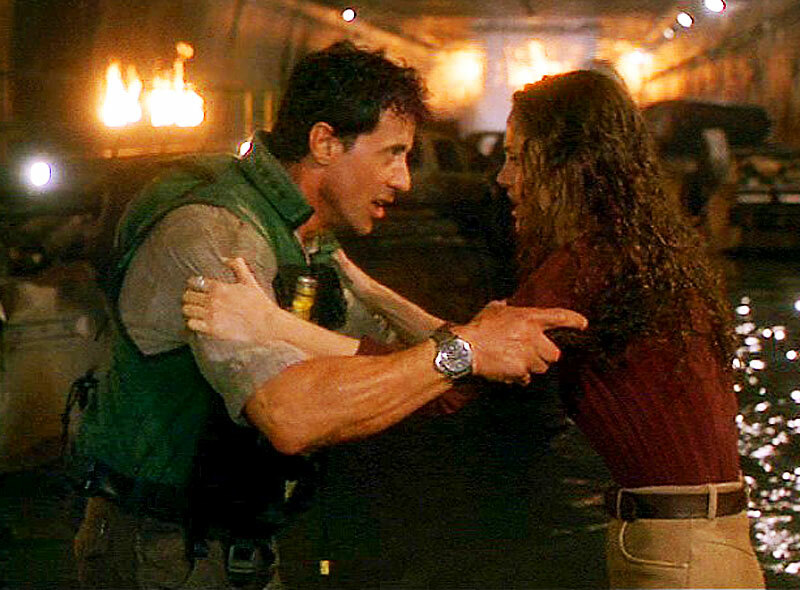 This question largely revolves around the advent of the rotating bezel. I believe Rolex invented and was first to market with earlier Turn-O-Graph models with rotating bezels, but that is a different investigation for a different day. 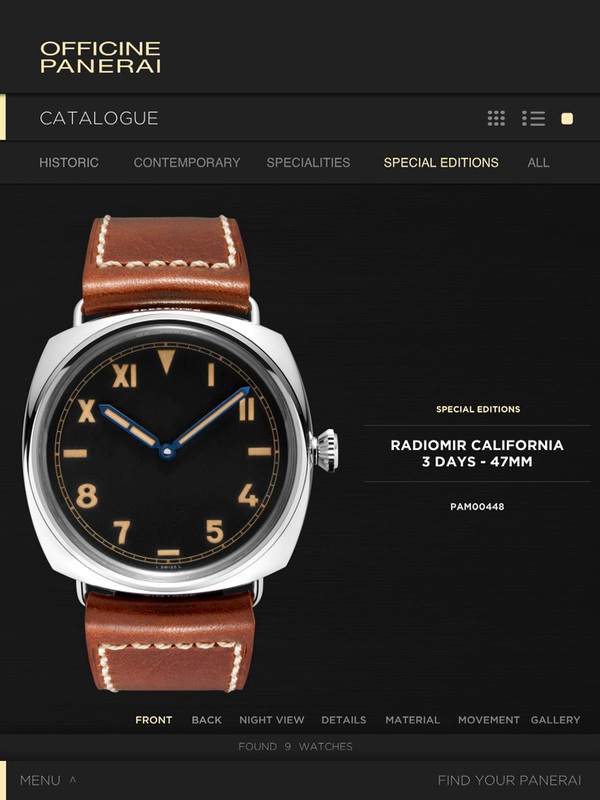 The Rolex made Panerai featured a Rolex Oyster Case with a black dial with what today is referred to as a "California" dial. 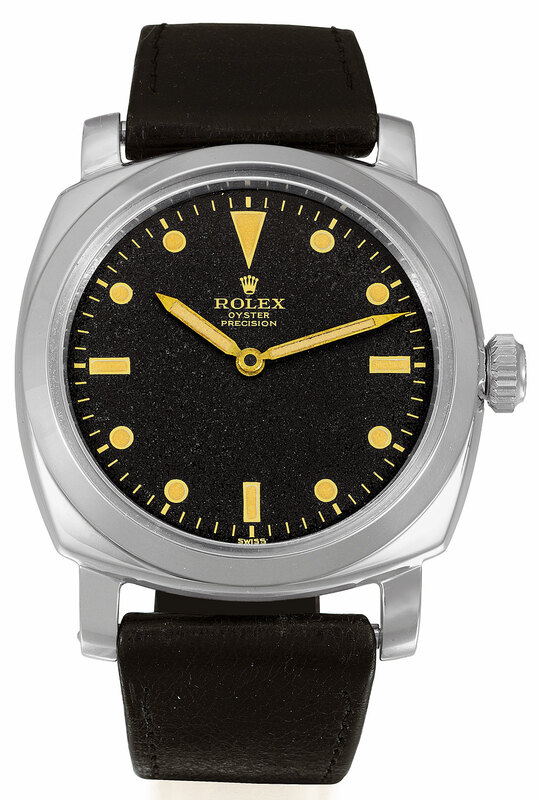 The 3646 was 47MM and featured lugs that were soldered onto the Rolex Oyster, waterproof pocket-watch case. 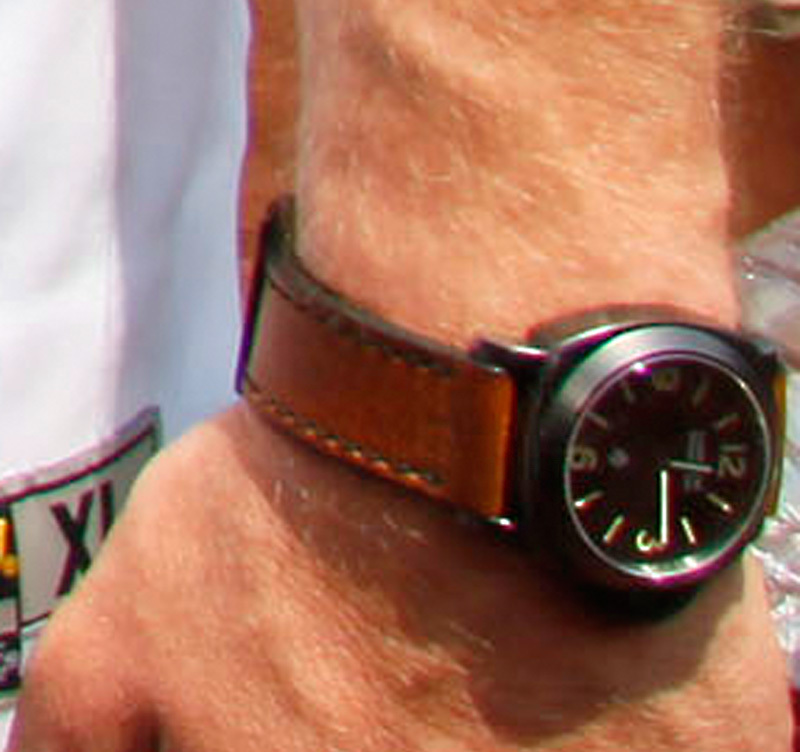 Pictured below, is another original 3646 Panerai made by Rolex. Notice the 3646 has no brand designation text on the dial. Why? 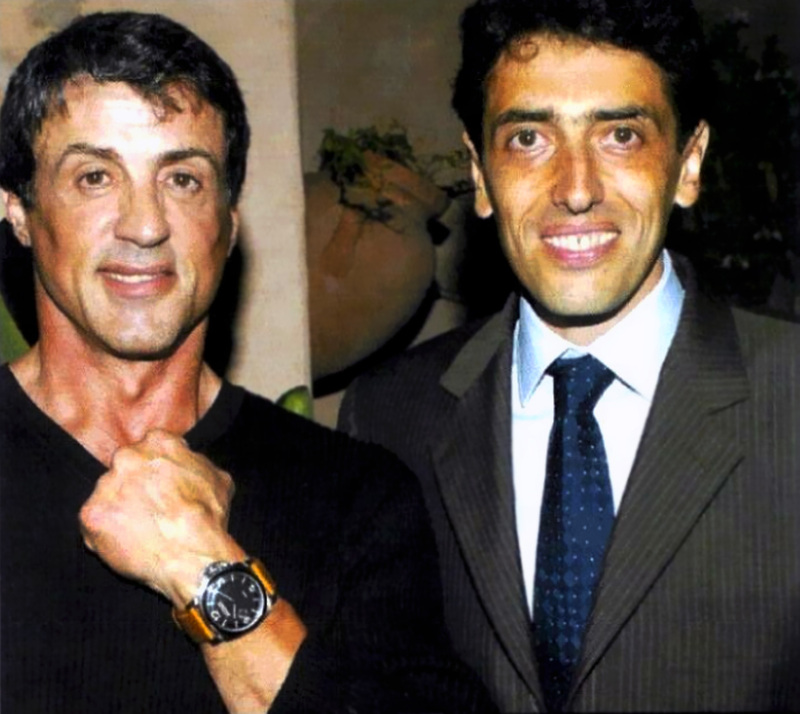 For one, these watches were part of a classified military program by the Royal Italian Navy, and they possessed technology they wanted to keep secret. 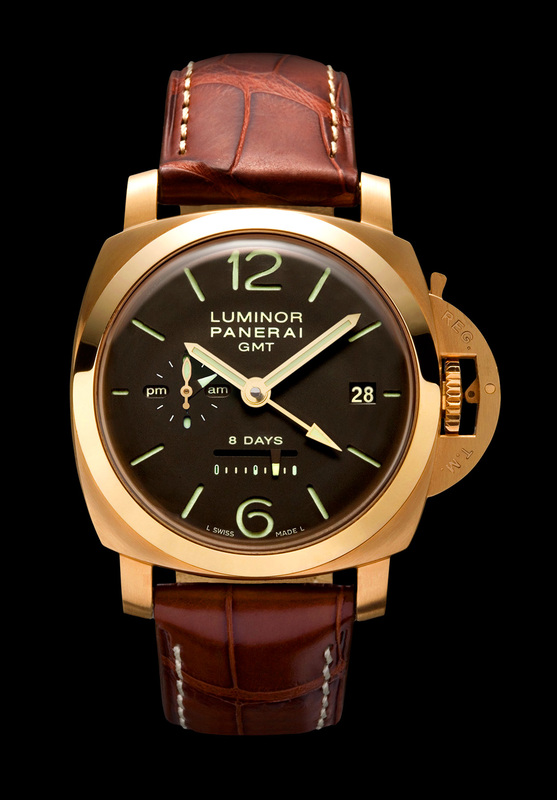 In particular, their amazing lume which was powered by Radium, which would allowed the watch to glow very brightly in the dark indefinitely. Over time, in the mid 1950s, the 3646 Panerai evolved into a new model named the Reference 6152-1 which maintained the 47MM waterproof Rolex Oyster case diameter but added fat lugs that were machined out of the same steel as the case. The watch also gained the now trademark Panerai 3, 6, 9, 12 dial as well as evolving the onion crown into a significantly beefed-up 8MM Rolex Brevet crown. This is a highly controversial topic, and I don't pretend to have all the answers, but I will simply put all the puzzle pieces I know of on the table, so we may all examine them, and I will attempt to put them together to solve this fascinating puzzle. 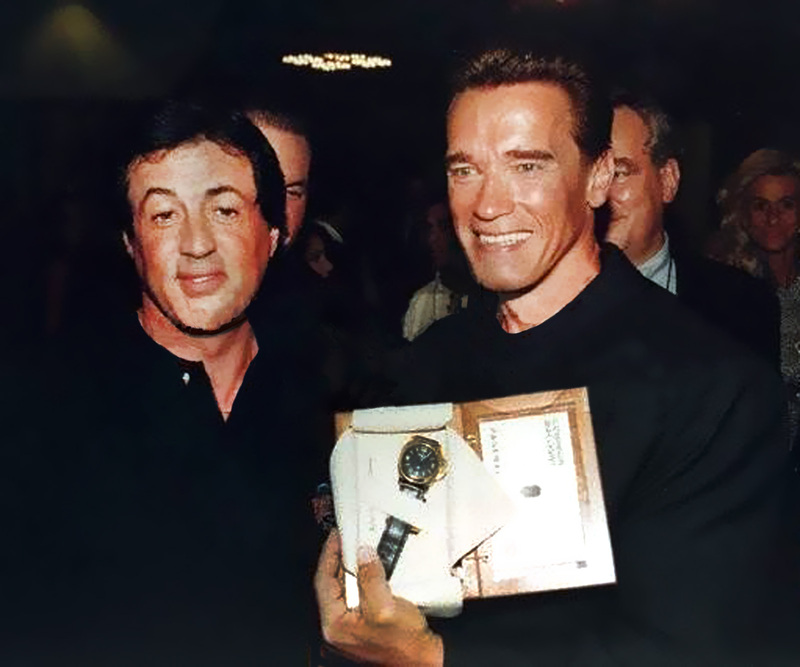 There are several mystery Rolex watches that remain enigmatic, and to the best of my knowledge this is the first time they are all showcased together. The first one we will examine is a Rolex Oyster Precision Reference 6152 made in 1955. 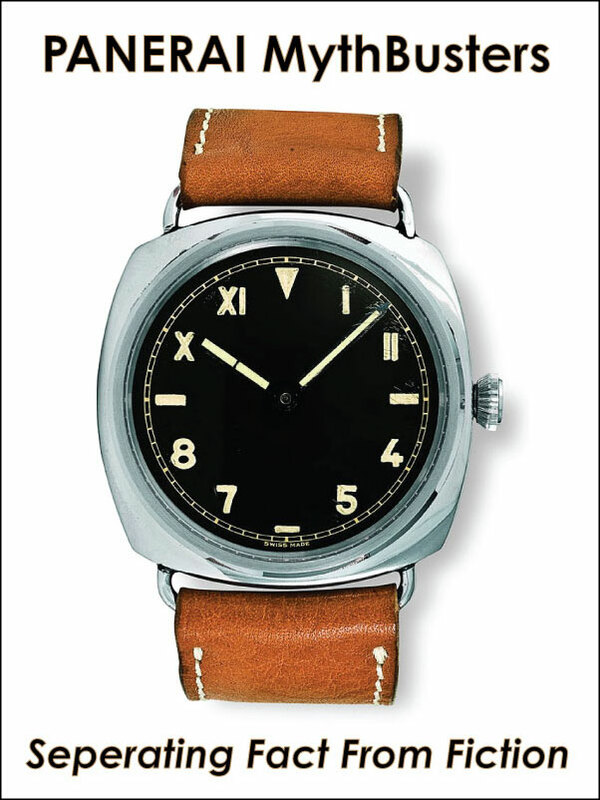 This watch is featured in Mario Paci's Panerai book. 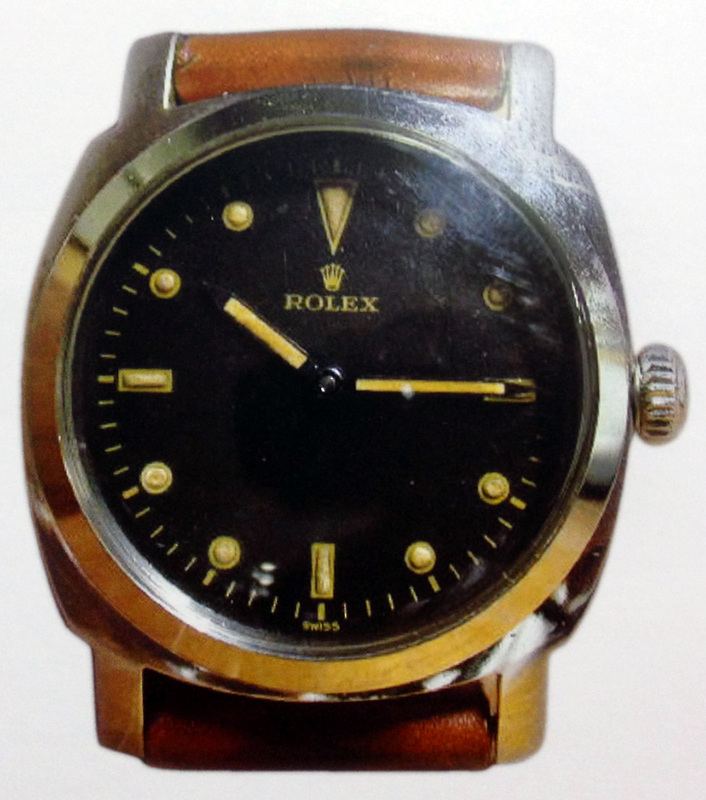 This watch with Rolex inscriptions on the dial, ref. 6152 case and Rolex movement Cal. 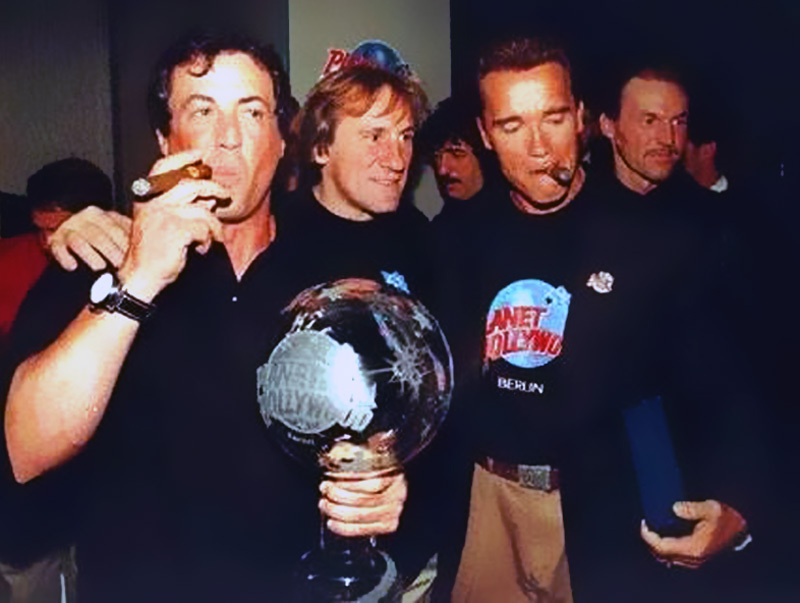 618 (16 lignes). 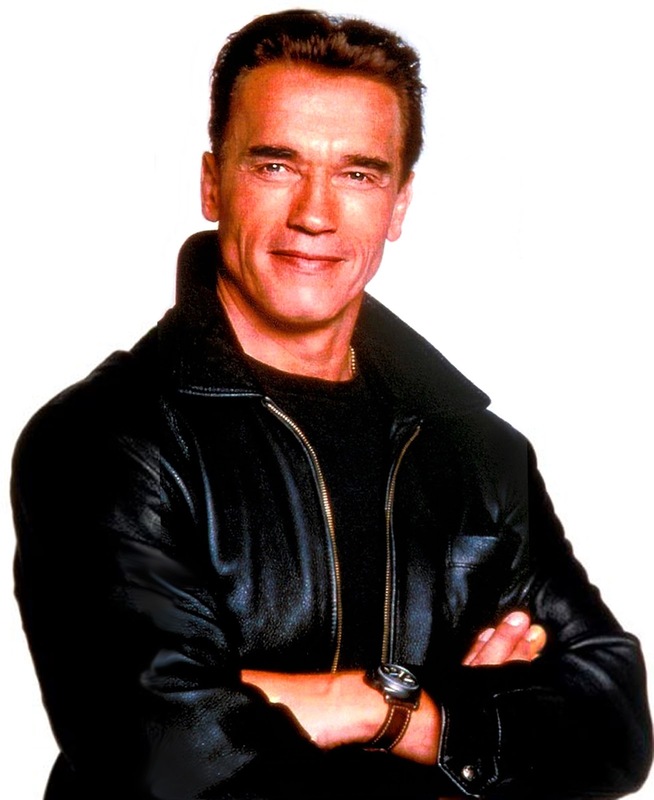 After many years of skepticism and doubts about the authenticity of this watch in the year 2000, the owner of the watch wrote directly to the House In Switzerland to ask for some explanations. 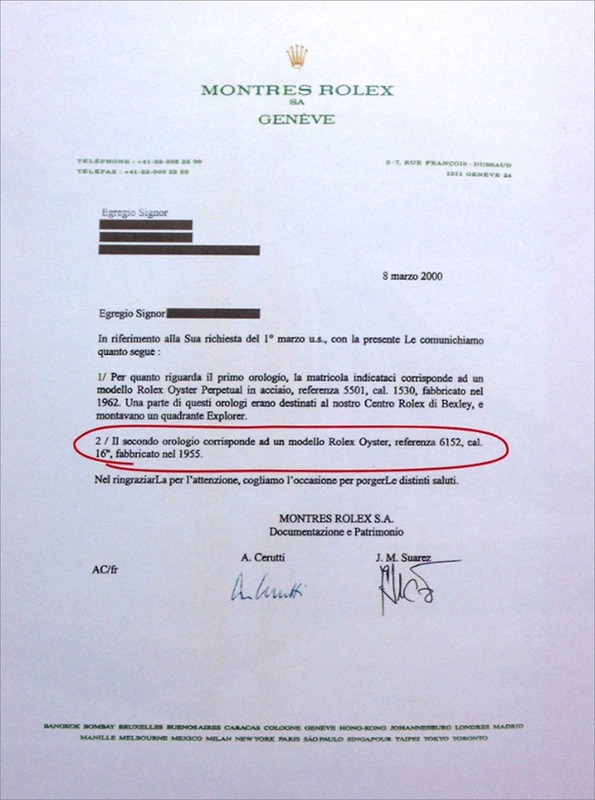 In a letter dated 08/03/2000, Rolex of Geneva confirmed the authenticity of the watch and indicated 1955 as the production year, thus resolving any reservations the owner previously had. In these pictures, you can see one of the few pieces in existence. This watch, which is as rare as it is impossible to find proves the deep bond between Rolex and Panerai. 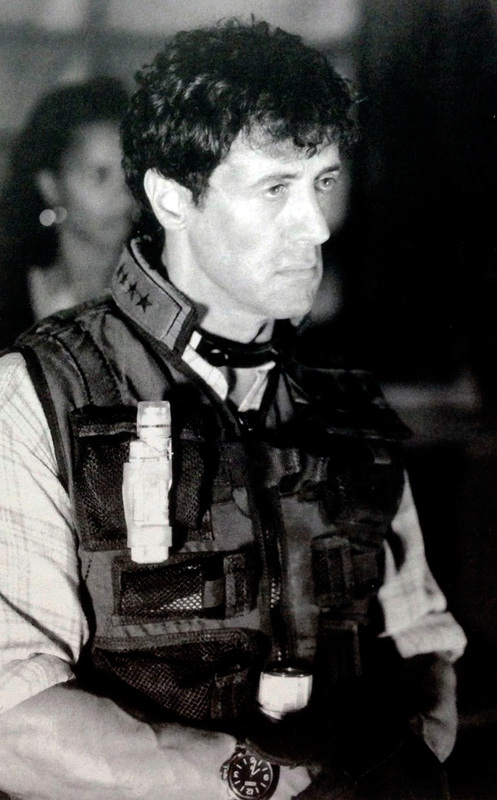 The case is the unmistakeable on that was used in the later models 6152. 1 / For the first clock, the serial number indicated to correspond to a model Rolex Oyster Perpetual steel reference 5501, cal 1530, manufactured in 1962. 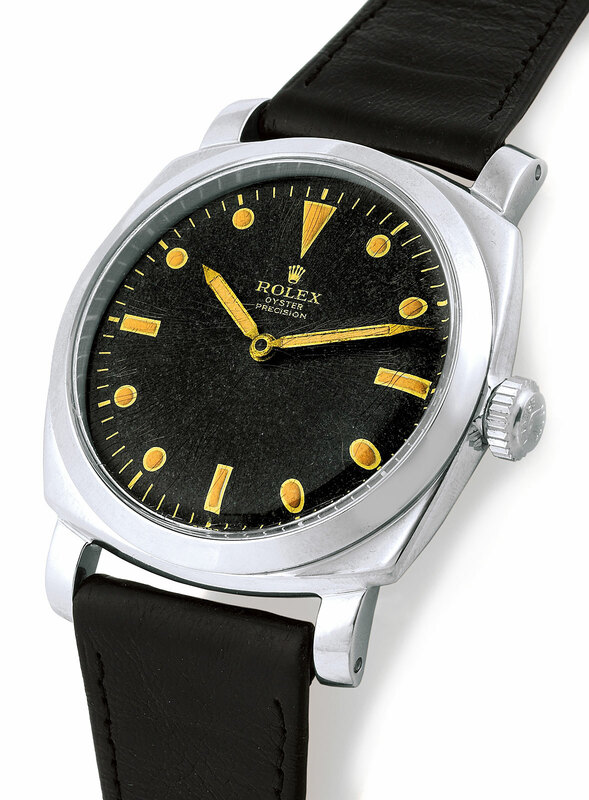 Some of these watches were intended for our center Rolex Bexley, and rode a dial Explorer. 2 / The second clock corrisopnde a Rolex Oyster model, reference 6152, cal 16, manufactured in 1955. Thank you for I'attenzione, we take o'occasione disticti to offer you my greetings. Next, let's take a look at two 1954 Rolex Reference 6154 Models. The first one is a Rolex Oyster Precision Reference 6154 made in 1954. Over the years there has been controversy surrounding the authenticity of this watch. So is it real? I don't know for a fact that it is real, but let's assume it is. Pictured above and below are two different versions of this watch. The one pictured above was sold by the Antiquorum auction house as [Lot 194] in Switerland on October 14, 2007 for 221,500 Swiss Francs which is around $200,000 U.S. today. The second watch pictured below was sold at an earlier Antiquorum auction in New York on June 14, 2006 [Lot 162] for $86,400. Amazingly, the price almost tripled in 14 months!!! The back-story/legend/myth is when Rolex stopped making Panerai watches in or around 1954, they had a bunch of extra 47mm Panerai cases in-stock so they decided to make up these watches. The really interesting thing is the design language of these two watches look like you morphed a 5513 Submariner dial with a small Egiziano Panerai 6154 case. Antiquorum said "To our knowledge only 6 pieces were made of this model: this is the first one." This next watch is even more controversial than the models shown above. This watch has been presented as being a prototype or very rare 47MM watch which appears to have an authentic Rolex/Panerai 3646 case. 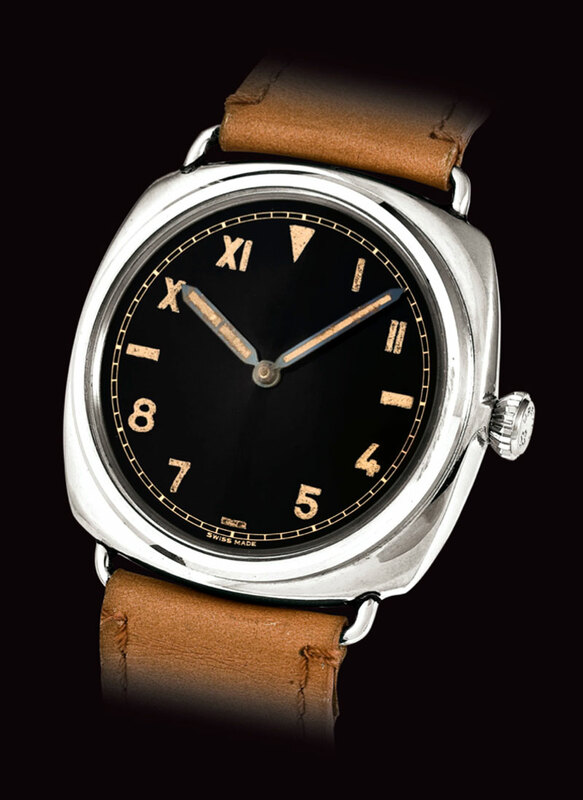 The California dial has Radium markers, and has an unusual wrist position, with the twelve o'clock marker located under the winding crown, which is usually positioned over the 3 o'clock marker. 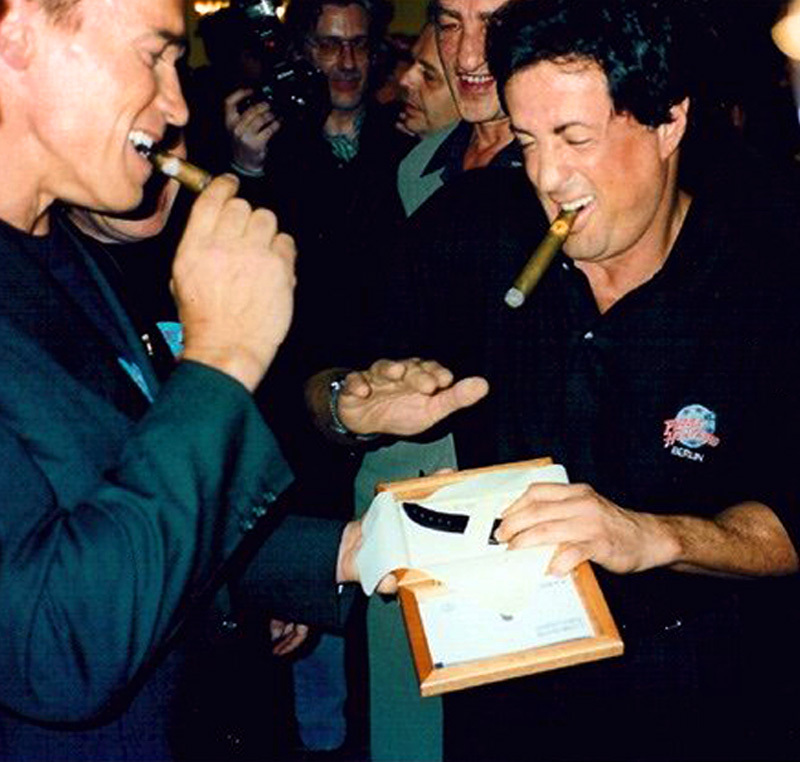 Many experts have argued over wether or not this watch is authentic and 100% original. Some people have agued they believe it is likely the dial and movement came from and were transplanted from an authentic 47MM Rolex Oyster Pocket-watch. 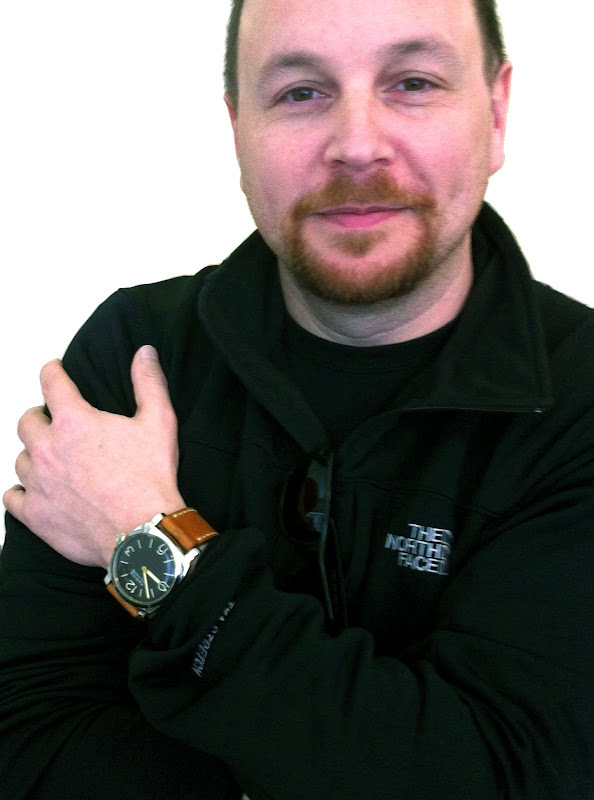 Others argue it was a prototype made by Rolex or Panerai, which never went into production. 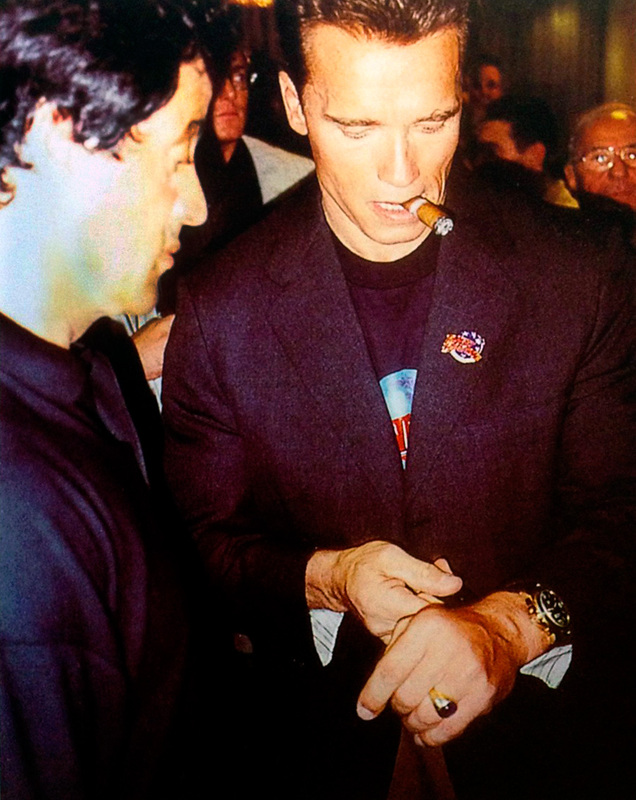 One thing is for certain, and that is the fact the watch looks pretty cool and interesting. One of the obvious questions, is wether or not all or any of these watches are 100% authentic and original, or are they the result of somebody investing a lot of time and resources in making customized fantasy watches with genuine parts? I plan to write Part 2 of this article in the future as time permits. Part 2 will take us deeper into evaluating the design ethos of the first real tool watches ever made, as well as diving deeper into the authenticity of the above shown watches. In Part 3 we will will explore how much of the DNA from the Rolex made Panerai watches ended up in the first Rolex diving watch known as the Rolex Submariner–which went on to became the most iconic and copied watch in history. 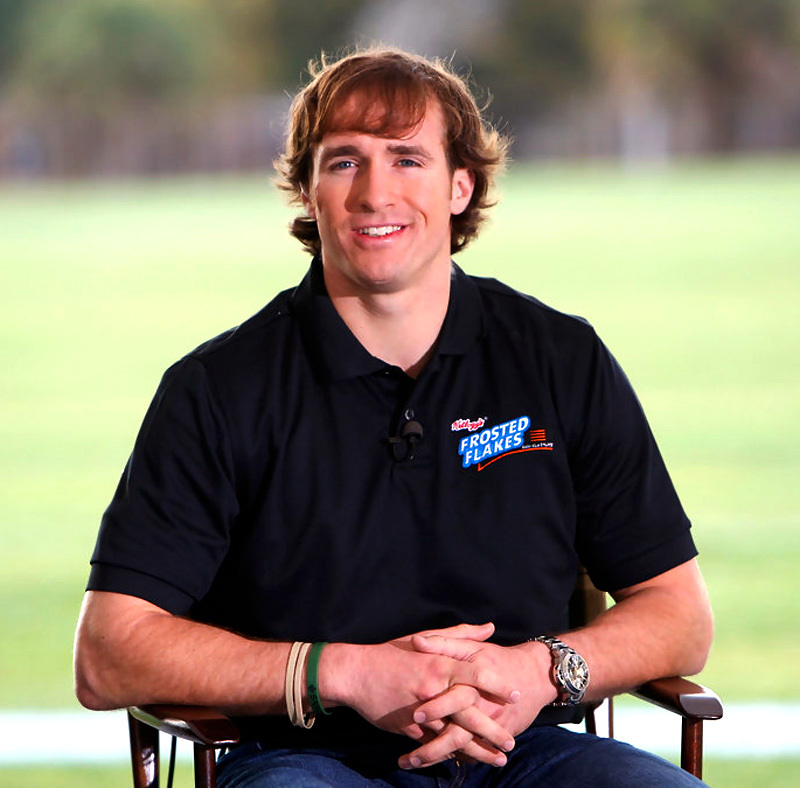 Drew Brees is a legendary NFL football player who holds multiple NFL passing records including being the fastest to reach 40,000 yards passing, as well as being the all-time single season passing leader with 5,476 yards. 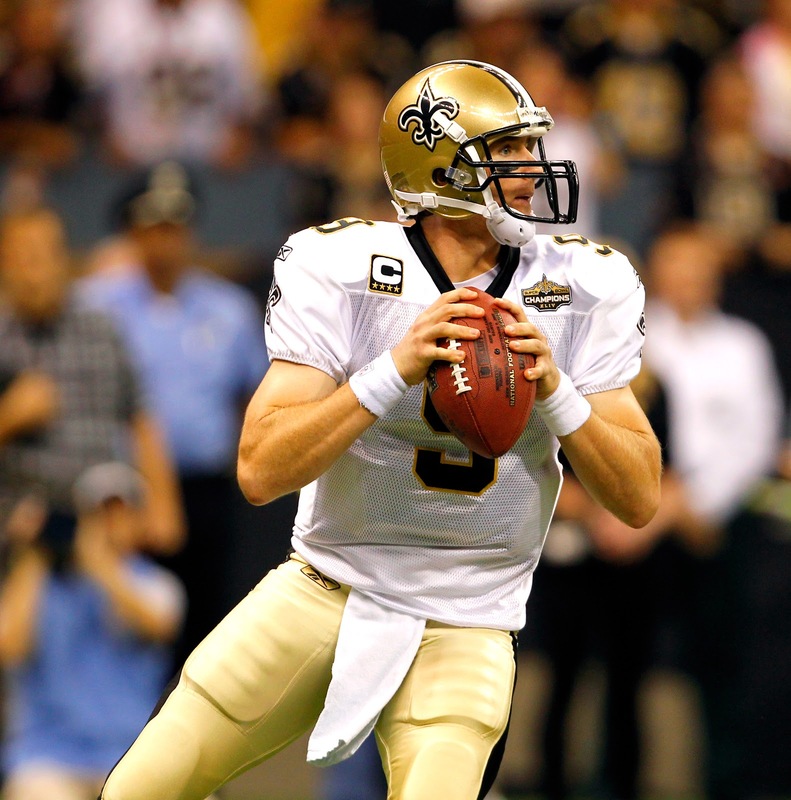 He also holds the NFL record for most consecutive games with a passing touchdown at 54. 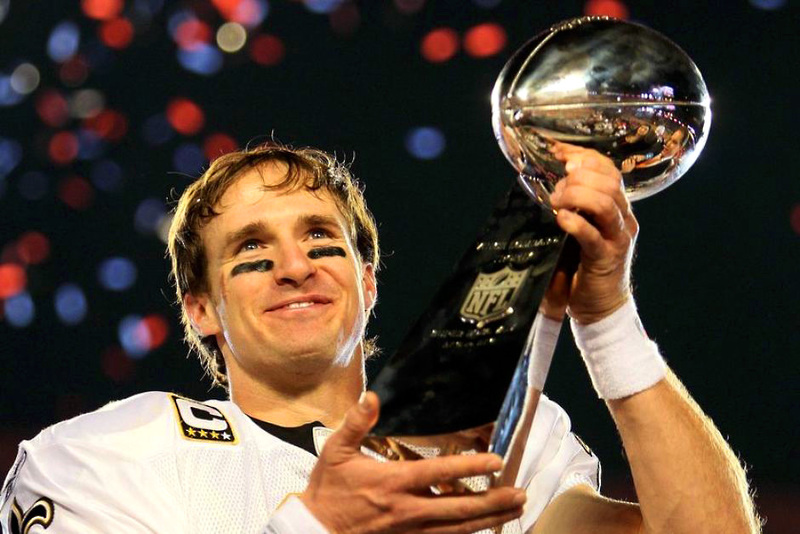 Drew Brees led his New Orleans Saints to win Super Bowl XLIV in 2010 against the AFC champion Indianapolis Colts. This represented the very first time the New Orleans Saint ever played in the Super Bowl. 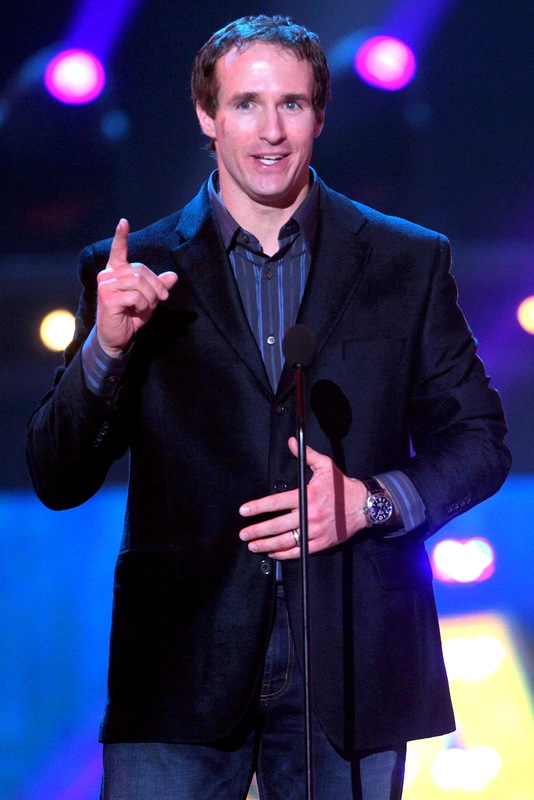 Drew Brees is a big fan of Officine Panerai watches and owns and wears many different models as seen in the following photos. 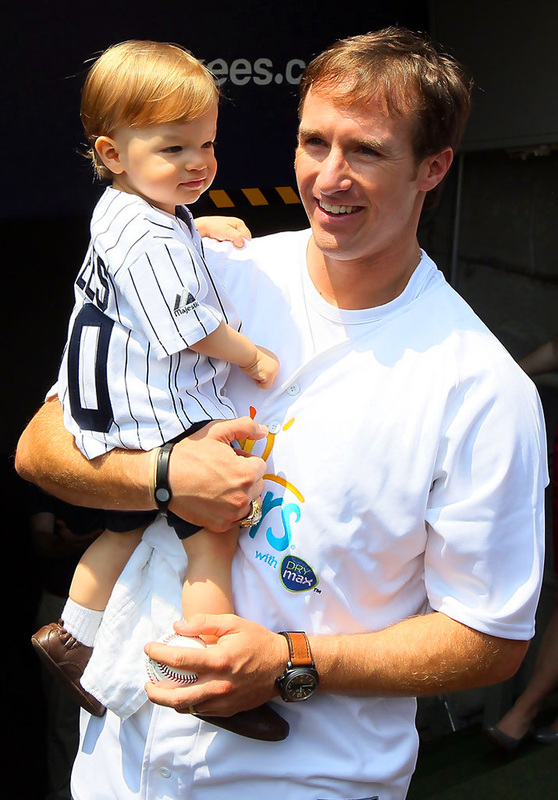 This first photo shows Drew holding his son, Baylen Brees at a New York Yankees game the New York Mets on June 20, 2010 at Yankees Stadium in the Bronx borough of New York City. 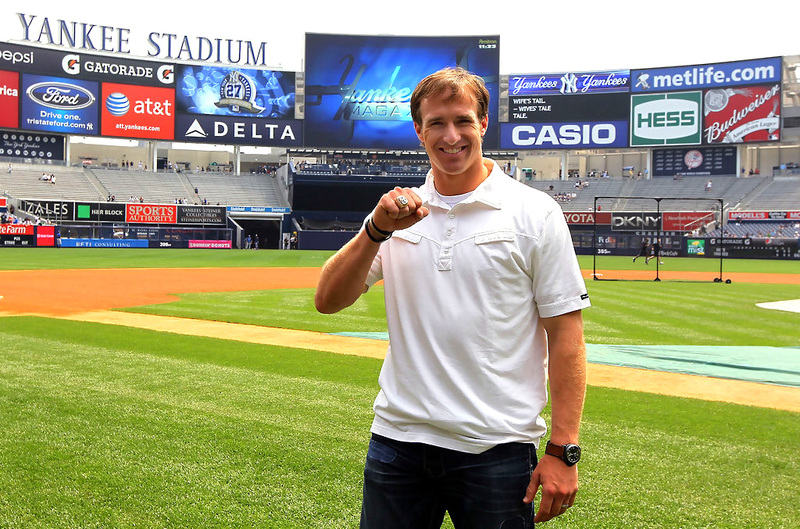 In the image above and below taken at Yankee Stadium, we see Drew Brees rockin' his special Limited Edition 44MM PVD PAM 360 which was made exclusively for Paneristi.com forum members only. 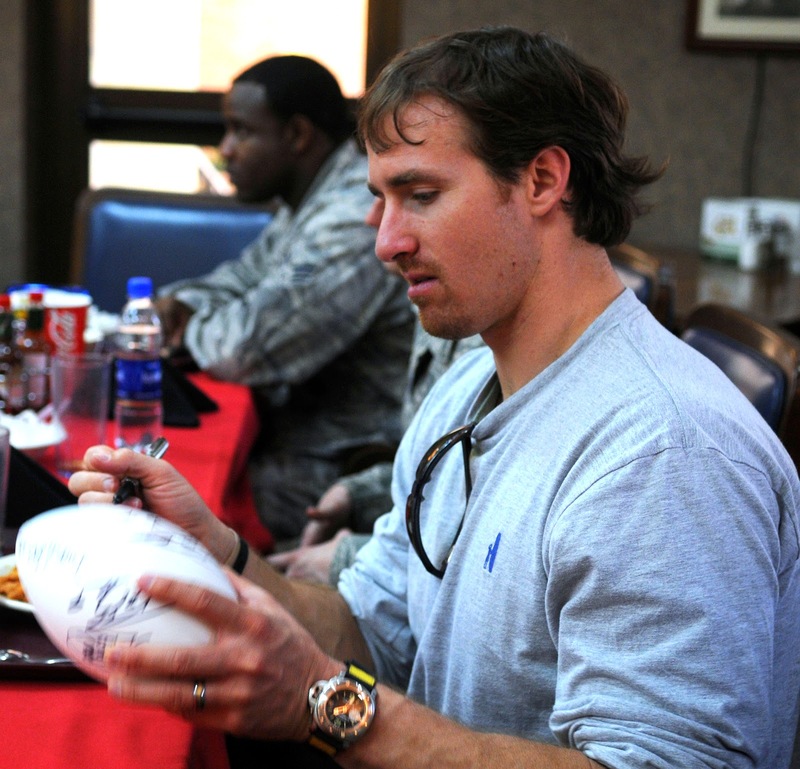 Drew has spend a great deal of time traveling the world to visit with U.S. Armed forces as seen above and below. The photo below was taken at Icirlik Air Force Base on March 24, 2010. In the photo above and below, we see Drew wearing a 44MM Titanium Panerai Luminor Submersible Reference PAM00025 OP 6528 on a special yellow and black (Bumble Bee) Panerai Velcro strap. 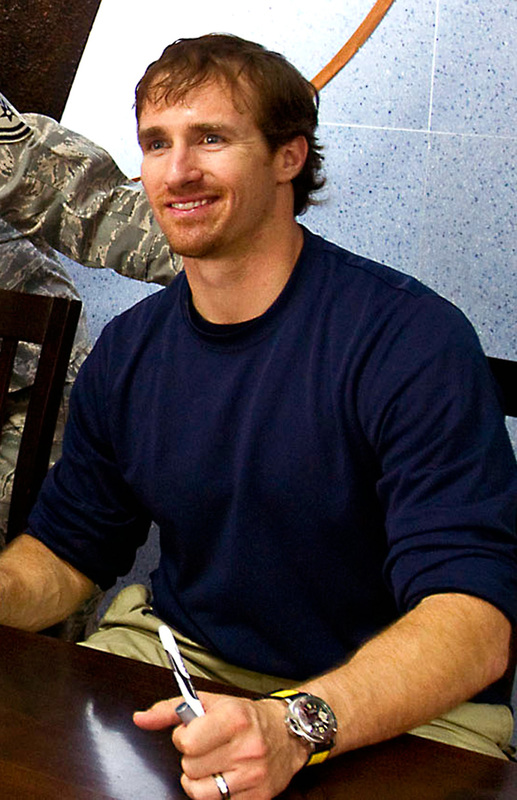 This last image of Drew Brees shows him wearing a Panerai on a stainless steel Panerai bracelet in 2008. 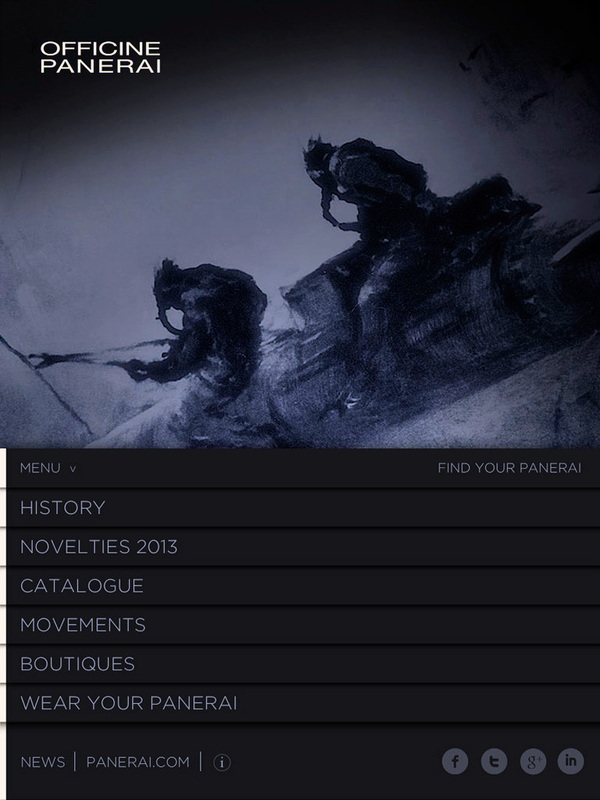 Panerai just introduced a free Panerai Application for the iPad and iPhone which is really cool. The image below is what the iPad App looks like when you first launch it. If you click on the MENU button in the bottom left hand corner, a menu with the following options pop up. 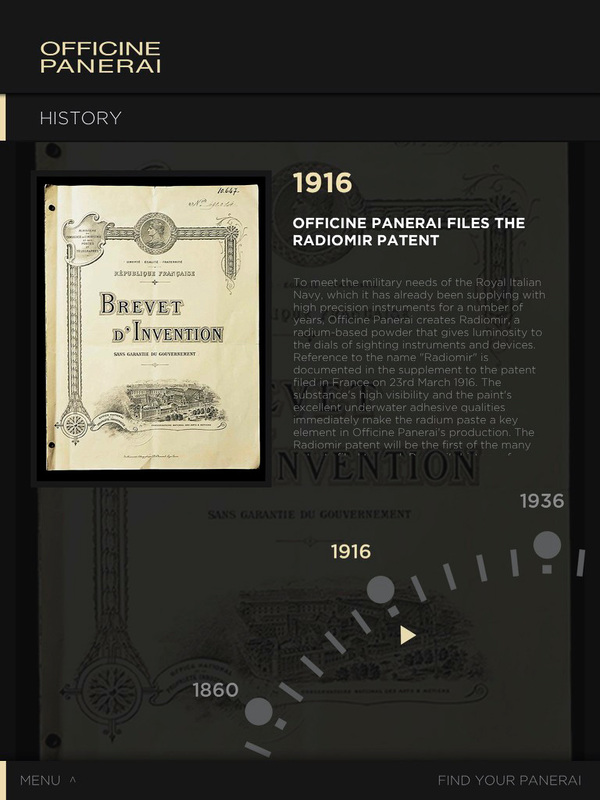 The Panerai Application has a great history overview that walks you through a timeline of Panerai achievements. 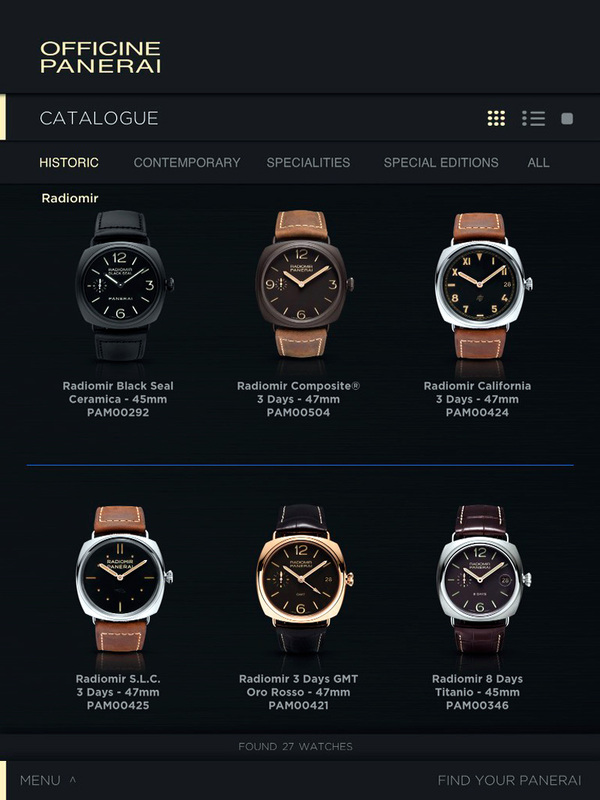 The Application has a catalog that has all the current Panerai watches, and you can click on them for detail. 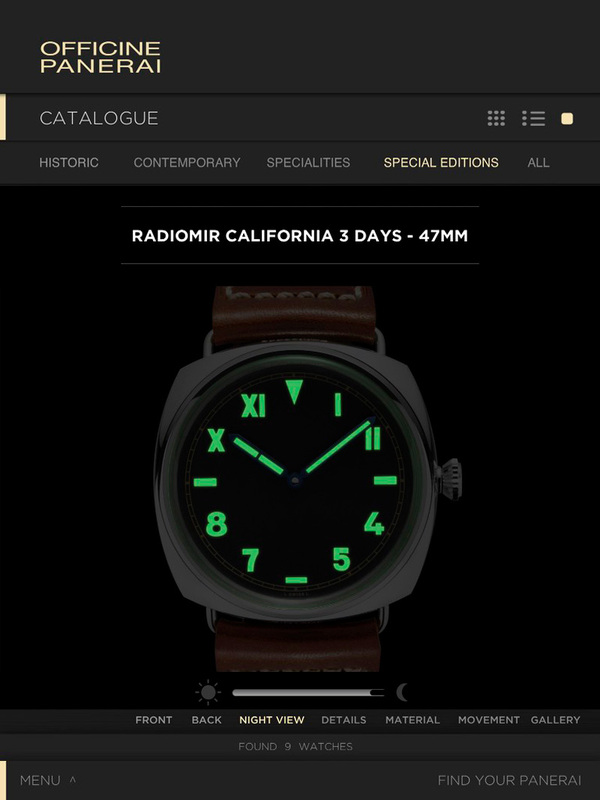 The detailed view in the Panerai iPad Application even has a Night View slider so you can see what the lume will look like at in the dark!!! 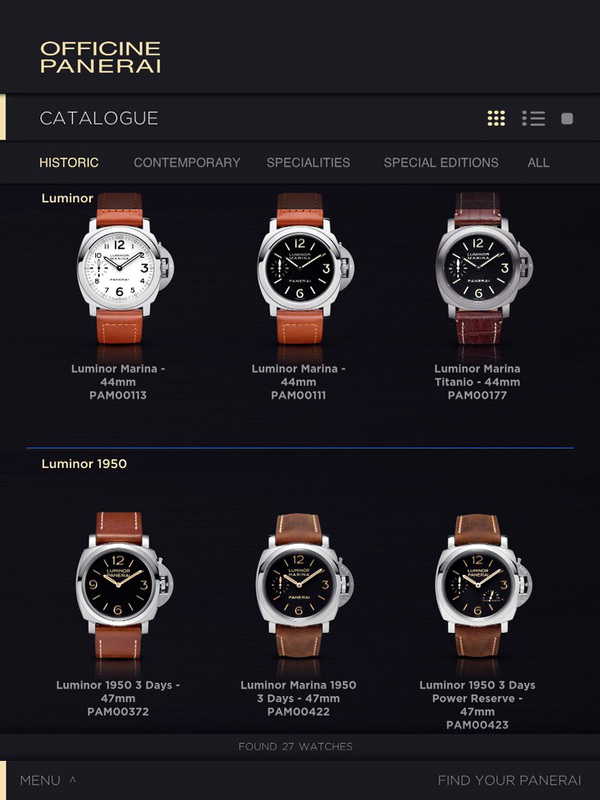 The Panerai App also has a function that allows you to take a photo of your naked wrist and then see what different models would look like on your wrist (not shown). 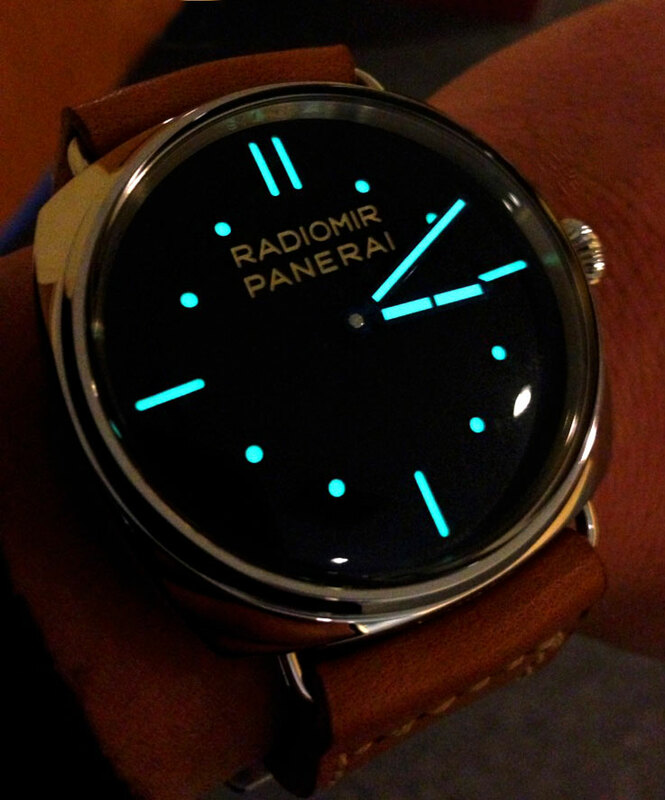 This helps to give you an idea of what different Panerai watches would look like on your wrist. 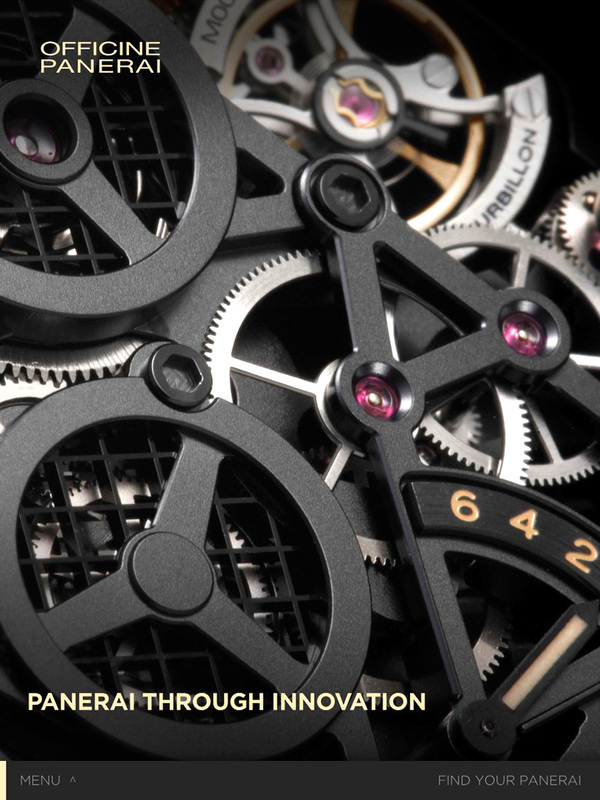 Overall, the Panerai iPad/iPhone Application is very cool and offers a fun experience that is educational and interesting. 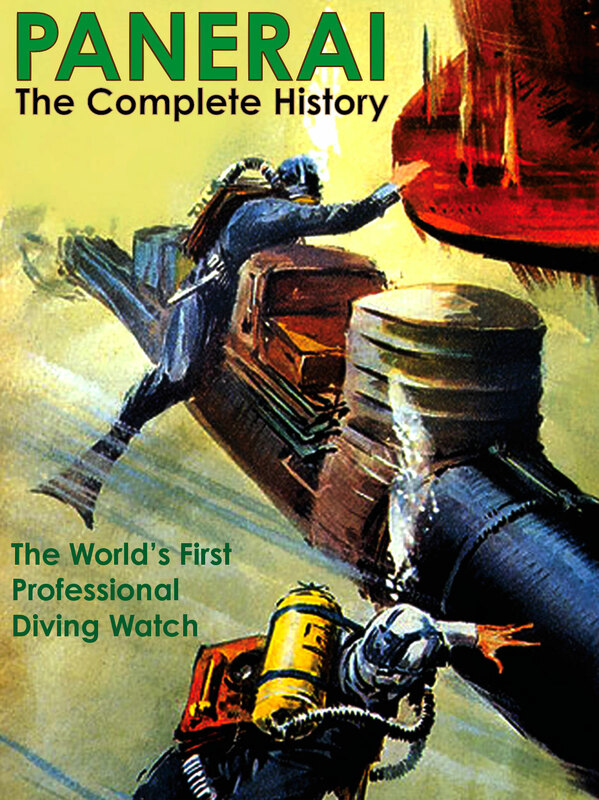 • First Underwater Demolition Watch. 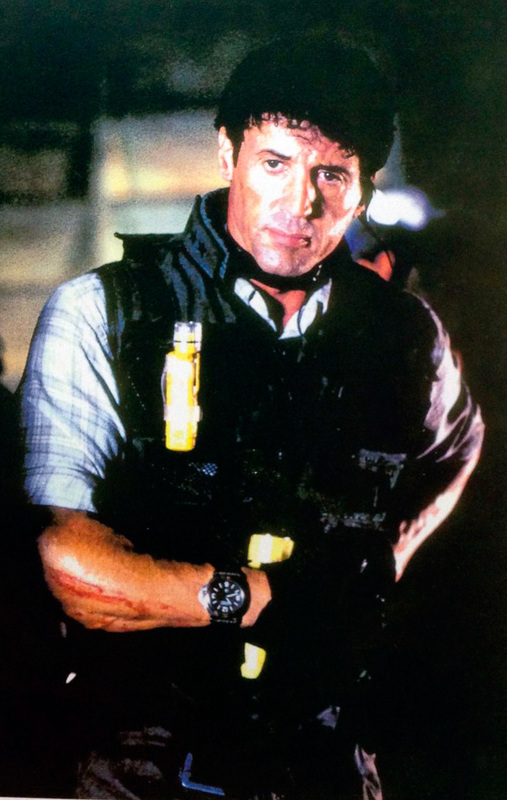 • First Special Forces Watch. • First and only watch made for another company by Rolex. • First Reference Watch Rolex Looked At When They Designed The Submariner In The Early 1950s (as seen below with the Radiomir Panerai Reference 3646). • First Super Bright Dial Lume Watch (Meant for underwater viewing in the dark and increased visibility at all times). • First Wrist Watch With Jumbo Winding Crown. • First Watch With Jumbo Bottle Opener Style Buckle (For easy removal). 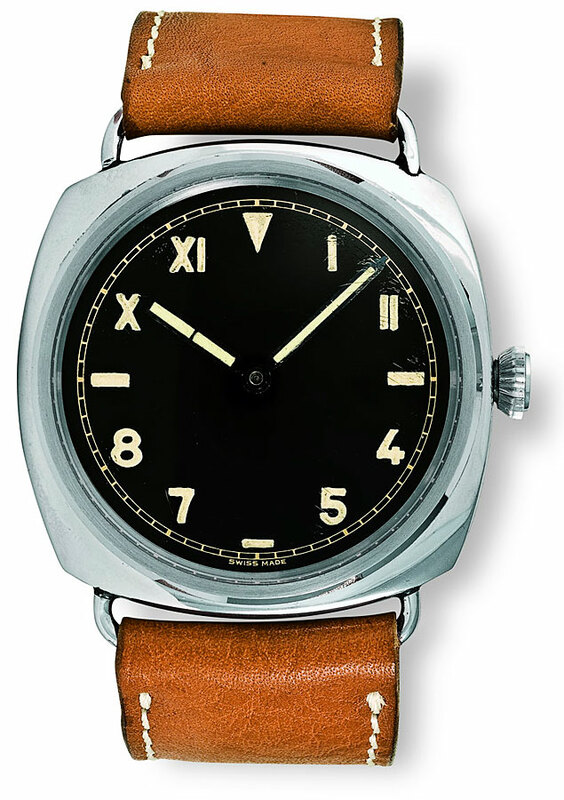 • First Watch With A Tight Seal Device (Crown Lock 1954). • First Oversized Strap (Long Tail) Designed To Be Worn Over A Diving Wet-Suit Wrist Cuff. • First Watch To Accommodate A 26MM Wide Strap. Jillian Michaels is a personal trainer, talk show host, personal trainer and entrepreneur from Los Angeles, California. She is best known for her appearances on the NBC TV show, The Biggest Loser as well as Losing It With Jillian. Jillian Michaels is wearing a Contemporary Luminor Panerai 1950 8 Days Oro Rosso GMT PAM00289 which is made out of Rose Gold. The first photo above of Jillian Michaels was taken at the 2012 CES trade show in Las Vegas, and you notice she is wearing her gold Panerai. Jillian Michaels gave the 2012 CES Keynote, which is featured below. 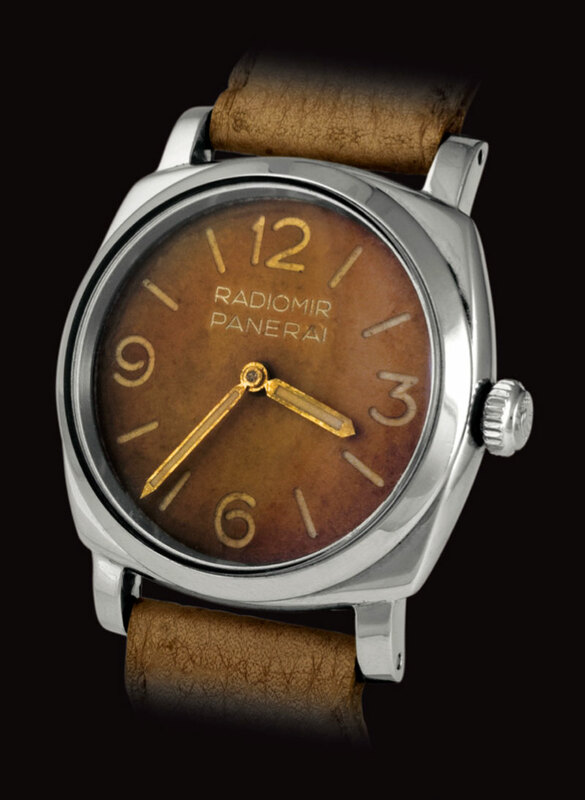 Brian's Historic Panerai Radiomir S.L.C.